Our organization is indulged in offering Silver Foil Glass Beads Chart (BBI-SF-03) to our clients. It is exclusive ranges have been made by our well-qualified team of designers, and are made up of silver coatings in the inner surface of the beads. These are very much favored and are used in varied functions. It can be availed at most competitive price. Characterized by specific colors, glorious designs and shapes, these silver foil glass beads make the product fun focal point. We are instrumental in manufacturing silver foil glass beads that come in enthralling shades, cuts and patterns. These are best in quality and used to embellish jewelry, garments, home décor items and fashion accessories. These silver foil glass beads can be customized as per the aesthetic preferences of our esteemed clients. We are one momentous substance, occupied with assembling, trading and supplying an extensive variety of Silver foil Mix Glass Bead. Our offered reach is delightfully outlined with multifaceted examples. With a specific end goal to guarantee the nature of this Button, our quality controllers test it on different parameters. We present the most enchanting range of Large Silver Foil Glass Beads. The Large Silver Foil Glass Beads feature exciting design and extraordinary sheen. 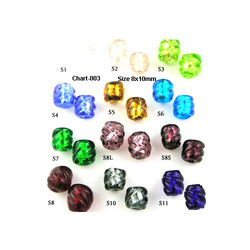 The range of Large Silver Foil Glass Beads is well colored and polished for the perfect finish. Stylish and durable, the beautiful Glass Foil Beads are very popular among the clients. These Silver Foil Glass Beads are manufactured using optimum quality glass material. 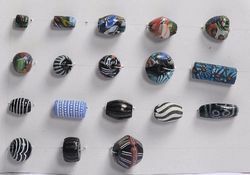 Available in various shapes, these beads are silver foiled and come in various colors. We ensure that the beads are stylishly cut and shaped, and have a fine polishing. Our company holds vast experience in this domain and is involved in offering Silver Foil Glass Beads. As we follow the automated warehousing system, we ensure safe assembling as well as storage of the entire lot. Moreover, the system is well managed by our team of experts. Thanks to our modern transit facility, that ensures safe delivery of the orders at required destinations. Our Glass Golden Foil Beads are available in various shapes like round, cubical, oval, cylindrical etc.